These are two photographs of Arapaho Chief Powder Face. 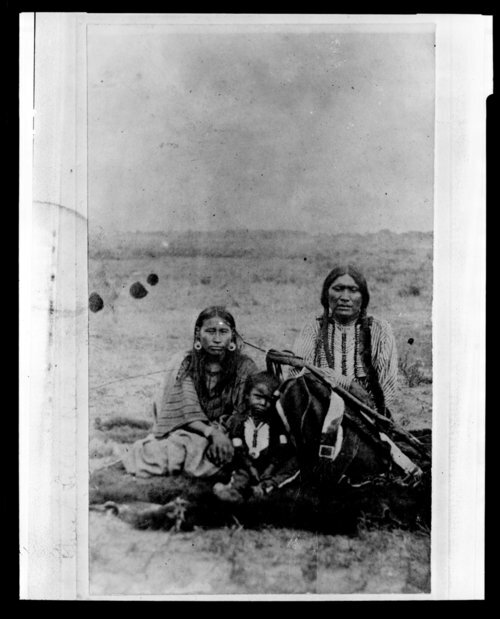 In the first photo the chief and his family are sitting on an animal hide on the ground. They are in traditional dress and posed in an outdoor setting near Hays, Kansas. The second image is a portrait of Chief Powder Face in his war bonnet and holding a large staff in his right hand. Funds for digitization provided by Mr. Steve Peckel in memory of William Chalfant.